Top-end consumer routers now can write to and read from an attached USB 3.0 drive at over 60 MB/s and 80 MB/s respectively. They also support SMB network sharing, DLNA media serving and some even serve FTP and have built-in Torrent downloaders. So what's a NAS maker to do if they still want a piece of that albeit low-end and barely profitable pie? 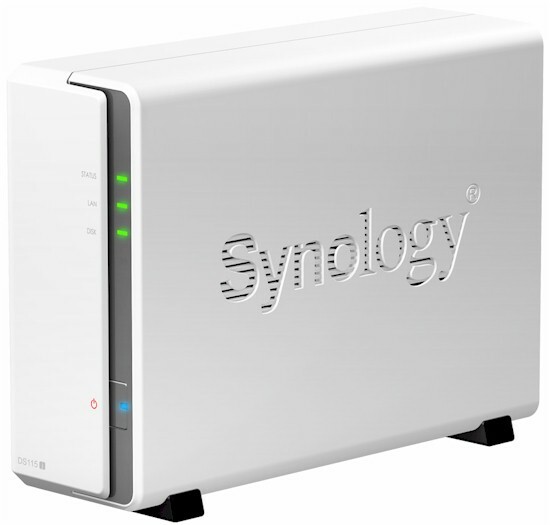 Synology's answer is the DS115j DiskStation, which is currently the cheapest way you can add a Synology NAS to your network. As is the trend with pretty much all NASes these days, it supports the same features as its more expensive siblings (RAID support excepted, of course). What you don't get are USB 3.0 or eSATA ports, hot-swappable drive or blazing-fast performance. But for around the price of some AC1200 class routers, you get a very full-featured standalone NAS with quite usable performance. The screenshot grabbed from its Quick Installation Guide, shows front and rear panel callouts. There is no front-panel USB port and only two USB 2.0 ports for attaching drives or printers and a single Gigabit Ethernet port for network connection. Getting into the DS115j to get the board shot below was easy, because the NAS has to be easy to open for buyers to install a 2.5" or 3.5" SATA drive. The Gigabit Ethernet chip is on the other side of the board and I didn't bother to take it off the metal mounting plate. So I only guessing that it's the Marvell Alaska device commonly used in other Synology NASes. Table 1 summarizes the key components. I popped in one of our WD Red 3 TB (WD30EFRX) drives for testing, which brought total power consumption to 10 W with the drive spun up and 6 W with it spun down. The little fan didn't have much work to do to keep things cool, so noise was rated Very Low. Thoughts on Smart Home Garage?